The El. Train will be calling into the station at Hoxton Hall this month with three one-act plays by Eugene O’Neill, presented together for the first time. Before Breakfast, The Web and The Dreamy Kid were written between 1913 and 1918 and depict fraught domestic scenes in a pre-prohibition New York. While Before Breakfast focuses on the bitter end of a broken marriage, The Web and The Dreamy Kid explore darker stories of prostitution and gang violence. “They’re about trying to live a good life and redeeming yourself from sin,” explains director Sam Yates. 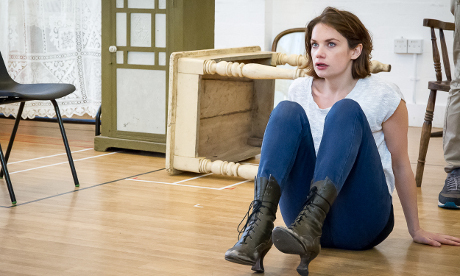 Olivier-winning actor Ruth Wilson (Luther, The Lone Ranger) will star in monologue The Web and Before Breakfast before making her directorial debut in The Dreamy Kid. Hoxton Hall will itself be transformed into a New York tenement block, with exposed brickworks and iron fire escapes featuring heavily and providing a backdrop to the lives that unfold during the performance. In between each play a seven-piece ragtime and blues band will perform, with the live music continuing after the show with re-workings of period cocktails from this exciting and turbulent era in American history served at the ‘Hell Hole Saloon’. An extension of the hotbed of action inside the poetical universe of the plays, the design is based on the Irish bar in New York at which O’Neill was a regular. “We looked at a lot of venues over London and Hoxton Hall was perfect because it has a history of its own,” says Yates, explaining the choice of venue.